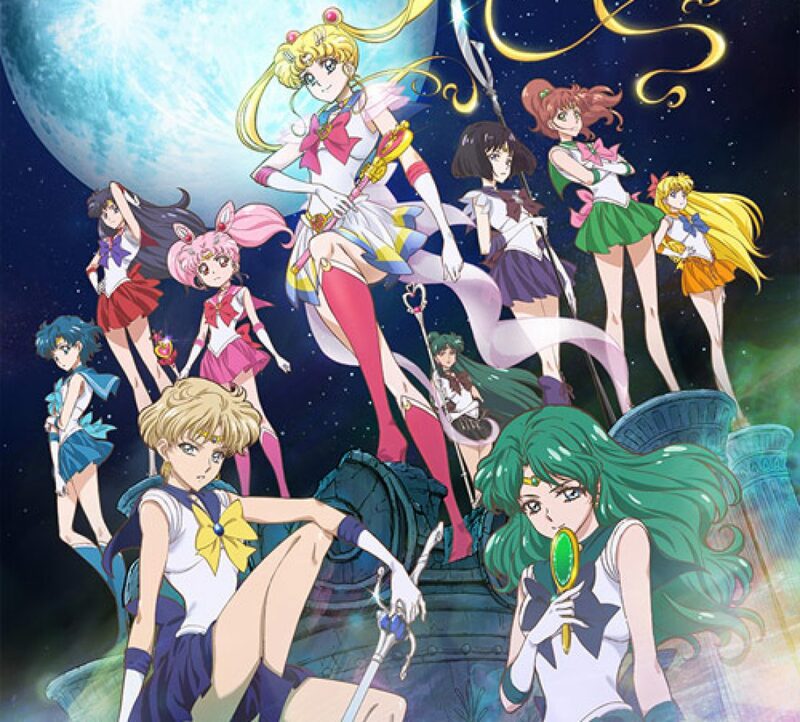 Sailor Moon Crystal Episode 2 Review | The Crystal Chronicles! I last left off with the lead in to Ami’s appearance. And without throwing in any extra episodes, Sailor Mercury is now a part of the Sailor Senshi. I like that it only took an episode before adding her in, especially since this series is trying to fit more of the manga in and it looks like they want to keep the older fans interested. This episode seems to emphasize mainly on how strong friendship can be. 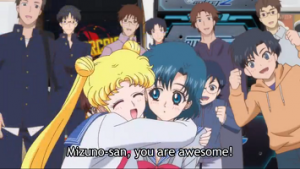 There is a huge amount of focus placed on Ami and Usagi becoming friends. While people were still gossiping about Ami not being interested in socializing, this series didn’t make the gossip as catty as the older series did. 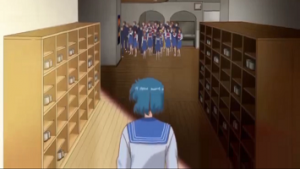 However, the scenes with Ami alone, whether it was the silence in the classroom as everyone stared at her solving a math problem or Ami watching everyone chatting with each other in the crowd, do a great job of demonstrating how ostracized she felt. I also loved the path crossing she had with Usagi, especially near the beginning where Ami observes Usagi laughing with friends. Later, when Usagi and Ami start talking to each other, Usagi starts off thinking she can befriend Ami to do better in school, but later on, takes interest in Ami and genuinely worries about her. Instead of getting jealous of Ami’s high score at the arcade, she congratulates her, hugs her, and calls Ami by her first name, welcoming her to do the same back. Usagi does get jealous about Ami’s prize (watching her smack the arcade machine was funny), but she’s still happy for her new friend. Then, when Usagi finds out about the “Crystal Seminar” disc, she worries about Ami’s well-being. Usagi’s friendship with Ami becomes something more than simply having a study partner. The bond created between Usagi and Ami also shows when Ami is possessed. Despite being in a daze, Ami reacts when the “teacher” grabs her pen. She is able to remember Usagi’s encouraging words and later runs to retrieve the pen when it is tossed across the room. 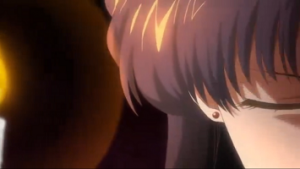 Then when she witnesses Usagi trapped by the enemy and about to be finished off, Ami awakens from the spell. With that, her powers also awaken and she transforms into Sailor Mercury. 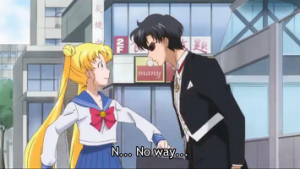 Aside from the theme of friendship, I like how Usagi and Mamoru continue to cross paths. It seems that the crumpled paper toss will be a running gag; not that I mind though because their bickering isn’t vicious in this series and Usagi’s blushing is cute. So far, I like the coherence this series has. It makes sense how Usagi is getting close with other key characters. Again, the only major downfall of this series is how the faces are drawn in various scenes, but there has been news about them getting fixed, so I am looking forward to seeing the faces improve (and stay a little more consistent). Also, the end of this episode shows Rei. She was one of my favorites in the original, so I’m pretty excited to see what this series will do with her.